If your practice isn't already ordering online,you should definitely look into it, and if you are ordering online, there might be some ways you can further simplify the process. Today we want to share with you some quick tips that will make your online ordering processes faster and easier. Whether you're a single practice location, or a multi-location practice, ordering ophthalmic products is a big part of your business. So make sure that you're doing it as efficiently as possible. A big part of keeping your patients happy is making sure that they get their products back correctly, and quickly! Ordering products online will get your patients their products faster than phone and fax orders, and online error checking features help ensure that their orders are placed correctly! 1. Find a system that lets you connect to all of your labs online. It is no use connecting with only some of your labs online. To truly be an efficient practice, you should be able to reach all of your current labs online, and then some. Having a wide range of labs to connect with allows your practice the opportunity to grow. Plus, having access to all of your labs in one central place instead of having to visit each individual lab website is a huge time saver for your staff. 2. Consider integrating with your practice management system. Web-based ordering solutions are a great way to make your ordering and tracking processes more efficient, and if you're using a practice management system in your practice, your ordering solution should be able to integrate with it so that you don't even have to leave your system to place your orders. This will help you get more out of your practice management investment, and can help reduce data entry. 3. 24/7 availability is a must. 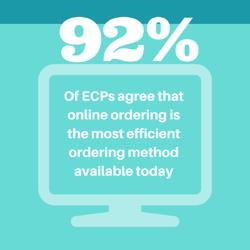 Online ordering services are great because they offer order status information and order-checking capabilities, but if your service isn't available to you at all times, you won’t be getting the most up-to-date information. If you’re still calling in orders, the lab has to be open, limiting the time you are able to place orders. A service that is always online, allows you to check order status, and receive order-checking feedback in real-time. 4. Utilize all of the important features. Your solution should come equipped with helpful features that you need to take advantage of. For example, archiving completed orders gets them out of the way, but still keeps them available if you need to access them in the future. “Drop to ship” allows you to ship frames you don’t have in your inventory straight to your lab which expedites the order and keeps customers happy. Another way to expedite orders is to take advantage of trace file uploading which allows labs to start creating lenses before the frames arrive. Finally, make sure that you are keeping up with partially complete orders by storing them under pending orders, so that you can easily keep up with the status of all your orders. Whether you are looking to kick-start your online ordering process, or searching for ways to improve what you are currently doing, these tips will help put you on the right track to create an efficient ordering process. Interested in a new online ordering service? Check out VisionWeb's solution!